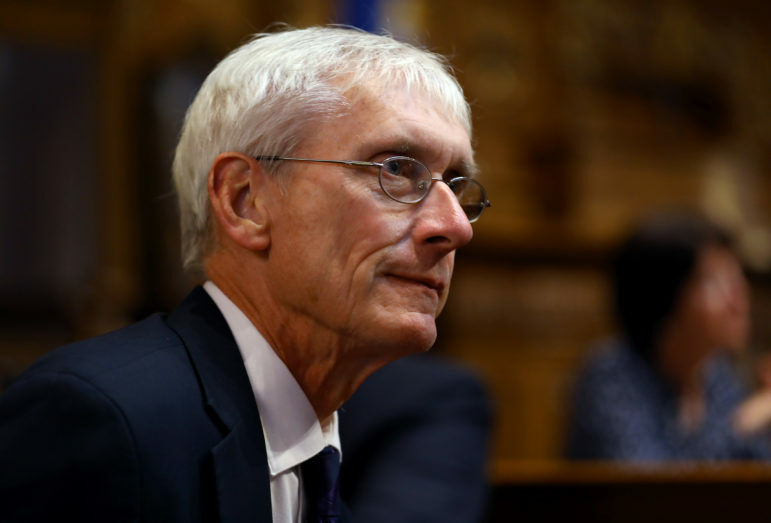 In his first speech as governor, Democrat Tony Evers went full olive branch to Republican legislators who must soon pass a state 2019-21 budget the governor can sign or veto. The 67-year-old former teacher, principal and state school superintendent didn’t indict Republicans for dozens of conservative changes enacted since 2011 or blame them for new limits to his powers passed in December’s “lame duck” session. He said his top three campaign issues — funding K-12 schools, college and universities; making sure more middle-income residents have health care, and fixing the state’ s highway system — got him elected. Evers has already learned that running for governor means compromise. Campaign promises often have to be watered down, delayed or abandoned when you’re governor. For example, Evers said in a WisconsinEye interview that the “middle class” tax cut that he announced before the election cannot become law until Jan. 1, 2020. When candidate Evers announced the tax cut, he didn’t mention that it may not help taxpayers until spring 2021 – more than two years after he took office. And, although Evers campaigned on breaking up the state jobs agency, the Wisconsin Economic Development Corp. (WEDC), he said his first state budget won’t call for replacing it with a new agency that puts more emphasis on regional economic development. Evers said he’ll live with the “hot mess” — the change in how WEDC is governed approved during the Legislature’s lame-duck session. Lawmakers will have control of WEDC’s board until September. “We need to get this nine-month thing done,” Evers said. And, although Evers, Democratic legislators and teachers’ unions have opposed School Choice for decades, the governor-elect said his first budget won’t try to kill it. Instead, Evers said, every homeowner’s property tax bill should show how much Choice costs their local school district. Finally, the highway finding impasse is no closer to being resolved. ]During the campaign Evers often said that “everything is on the table” to pay for highways – a vague phrase that his opponent Scott Walker warned signaled a huge tax increase. Evers had hoped to have a highway-funding plan shortly after becoming governor, but he doesn’t. Instead, Evers wants Craig Thompson, executive director of the Transportation Development Association, and his choice to be secretary of the state Department of Transportation (DOT), to broker that compromise. But Senate Majority Leader Scott Fitzgerald, who must schedule Thompson’s confirmation vote, said some Republican senators remember that Thompson pushed to raise taxes to pay for highways. “I have heard serious concerns over [Evers] appointing a provocative figure to head DOT who is a long-time advocate for special interests,” Fitzgerald said. Evers predicted that the Senate will confirm Thompson. The governor has no plans to name anyone else to run DOT.